It’s muddy underfoot as we pick our way through a wood off the shores of Loch Scridain in the south of Mull. It’s coming to the end of the season but Craig Ferguson knows this spot well and says there’ll be a few wild mushrooms still growing here. Further south, near Fionnphort (‘Port of the White Sands’), on the Ross of Mull, I’m greeted by lobster fisherman Johnny Lamont. We off-road in his truck through the disused Tormore granite quarry, towards his mooring. Johnny, who’s been fishing these bountiful waters for 30 years, opened Ninth Wave Restaurant with his chef wife, Carla, six seasons ago. “I was fed up with folk asking, ‘Where can I get a cooked lobster on a plate, and having to tell them Madrid. 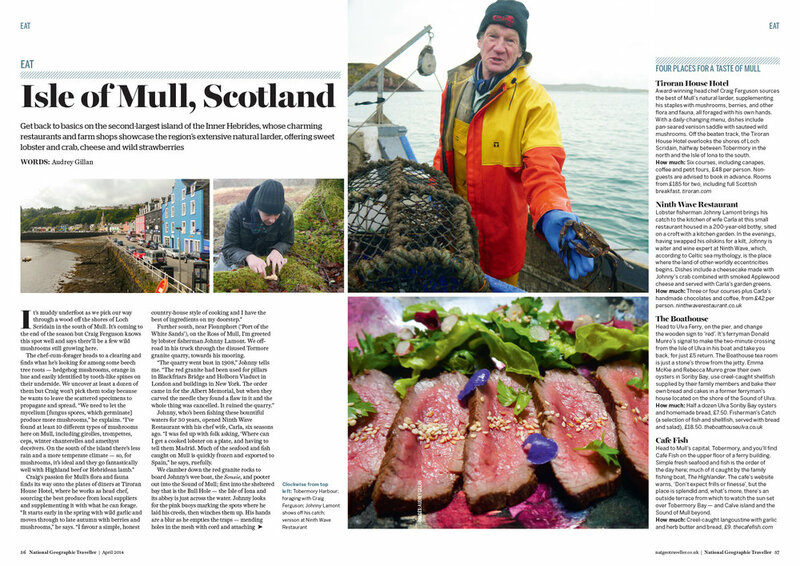 Much of the seafood and fish caught on Mull is quickly frozen and exported to Spain,” he says, ruefully. We clamber down the red granite rocks to board Johnny’s wee boat, the Sonsie, and pooter out into the Sound of Mull; first into the sheltered bay that is the Bull Hole — the Isle of Iona and its abbey is just across the water. Johnny looks for the pink buoys marking the spots where he laid his creels, then winches them up. His hands are a blur as he empties the traps — mending holes in the mesh with cord and attaching fresh saithe (coley) bait as he goes. Today, there are only brown crabs — which Johnny measures for size, keeping the larger ones and throwing the immature specimens back into the water — and velvet and blue crabs (the vast, unprofitable, bulk of most catches; the latter really only used for stock). One crustacean is notably absent from today’s haul. “I’d be happy as Larry and dancing up this boat if we caught a lobster,” says Johnny. The unpasteurised cheddar they make at Sgriob-ruadh Farm is aged onsite in cellars for between a year and 18 months, during which time it’s regularly turned by hand. The cheese is wrapped in muslin and lard, which seals it and stops it from drying out while still allowing it to breathe. As it matures, it occasionally develops blue veins, which only add to its flavour. Visitors to the farm shop are encouraged to help themselves if there’s no one here to serve them. They simply write down what they’ve bought and leave the correct money. This ‘honesty box’ policy is one of the greatest charms of Mull. Up and down the single-track roads crisscrossing this large island, you can stop for wild strawberries, eggs, mussels, vegetables or whatever else is in season, take what you need and leave what you owe in a wee tin. Award-winning head chef Craig Ferguson sources the best of Mull’s natural larder, supplementing his staples with mushrooms, berries, and other flora and fauna, all foraged with his own hands. With a daily-changing menu, dishes include pan-seared venison saddle with sauteed wild mushrooms. Off the beaten track, the Tiroran House Hotel overlooks the shores of Loch Scridain, halfway between Tobermory in the north and the Isle of Iona to the south. Lobster fisherman Johnny Lamont brings his catch to the kitchen of wife Carla at this small restaurant housed in a 200-year-old bothy, sited on a croft with a kitchen garden. In the evenings, having swapped his oilskins for a kilt, Johnny is waiter and wine expert at Ninth Wave, which, according to Celtic sea mythology, is the place where the land of other-worldly eccentricities begins. Dishes include a cheesecake made with Johnny’s crab combined with smoked Applewood cheese and served with Carla’s garden greens. Head to Ulva Ferry, on the pier, and change the wooden sign to ‘red’. It’s ferryman Donald Munro’s signal to make the two-minute crossing from the Isle of Ulva in his boat and take you back, for just £5 return. The Boathouse tea room is just a stone’s throw from the jetty. Emma McKie and Rebecca Munro grow their own oysters in Soriby Bay, use creel-caught shellfish supplied by their family members and bake their own bread and cakes in a former ferryman’s house located on the shore of the Sound of Ulva. Head to Mull’s capital, Tobermory, and you’ll find Cafe Fish on the upper floor of a ferry building. Simple fresh seafood and fish is the order of the day here; much of it caught by the family fishing boat, The Highlander. The cafe’s website warns, ‘Don’t expect frills or finesse’, but the place is splendid and, what’s more, there’s an outside terrace from which to watch the sun set over Tobermory Bay — and Calve island and the Sound of Mull beyond.